Inspectors can use the new EPOCH 6LT flaw detection system in difficult environments such as wind farms and construction sites. Optimised for inspections in hard-to-reach areas, such as bridges, wind turbines, offshore platforms and pipelines, the EPOCH 6LT is a compact, intuitive ultrasonic flaw detector. It enables single-handed operation with all the controls readily accessible for quick adjustments – even when wearing gloves. Well suited for rope-access technicians, the EPOCH 6LT conveniently attaches to a harness or leg, keeping the operator’s hands free to carry out ultrasonic scans with safety and comfort. To guarantee durability and maximise uptime, the EPOCH 6LT is drop tested and carries an IP65/67 rating for resistance against moisture and dust. Its clear 640 × 480 pixel display screen features an outdoor mode to make it easy to see A-scans when lighting conditions are challenging. The interface of the EPOCH 6LT flaw detector is simple and straightforward so technicians can spend more time on their inspection and less time adjusting the instrument. Despite the instrument’s small size, it has the features and functions to meet the requirements of nearly any conventional ultrasonic inspection application; it has all the core functions of the popular EPOCH 650 flaw detector and it fully complies with the EN12668-1:2010 standard. The intuitive software of the EPOCH 6LT consists of a two-screen, icon-based interface with a rotating display to make navigation quick and easy. Optional corrosion software enables a dual functionality, combining the ease of use of a thickness gage with the flexibility of a flaw detector. To speed up the setup, center-pin transducer ID recognizes which transducer is connected and automatically provides the correct settings. Optional wifi connectivity facilitates on-the-go data backups, setup downloads and access to cloud applications such as the Olympus Scientific Cloud. 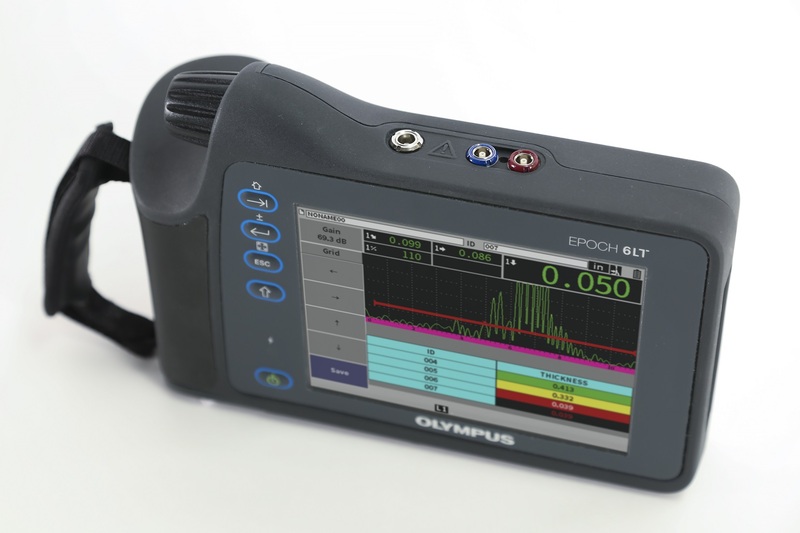 Olympus’ compact EPOCH 6LT ultrasonic flaw detector enables safe inspections in inaccessible locations without compromising on inspection capabilities. With excellent suitability for inspection of bridges, wind turbines, offshore platforms and pipelines, the EPOCH 6LT is a versatile solution, harnessing the power of portability in industrial inspection.